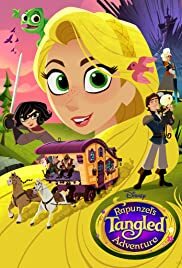 I don't know what I expected from a series made from Tangled, to be honest. I liked Tangled, didn't think it was the best thing ever but definitely a good time. This series however went up and abound my expectations! I didn't expect it to start (in the Before Ever After-movie) with Rapunzel feeling trapped again and not liking her happy ever after, even though Flynn/Eugene settles in like it's the best thing ever. It's so realistic though, for a character that have always been locked up and a character that used to have nothing. Not to mention I have yet to see a tv series EVER to portray such a good, healthy relationship as Raps and Eugenes. All the characters are cool, though slightly more one dimensional at times than the movie. The new characters (Cassandra and Varian especially) are interesting and gives us fun relationship dynamics. There is some silliness that might be a bit much at times but mostly the jokes are genuinely funny. The animation is really nice, and the colour setting in this series is to die for! I couldn't give enough praise to the people working on the colours in this series. The music is also surprisingly good and catchy for a series, things you find yourself humming all day.